The M-Track Hub is a 3-port USB monitoring interface that is perfect for anyone who demands a high-quality audio interface monitoring hub. 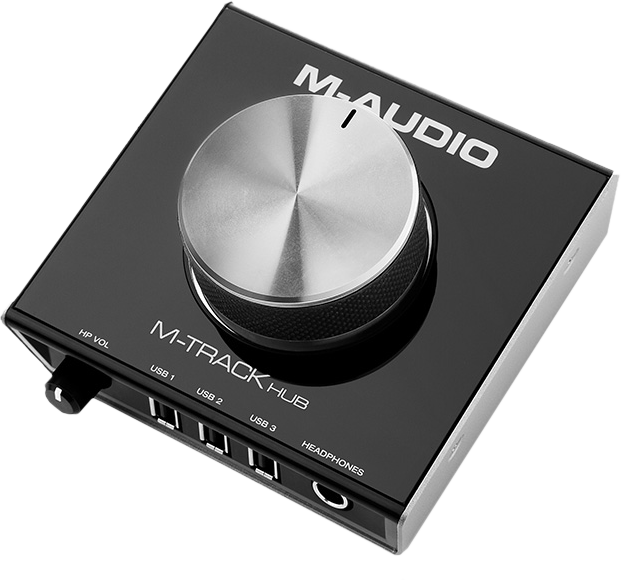 This article walks through a number of frequently asked questions about the M-Audio M-Track Hub. Does the M-Track Hub require drivers? Is the M-Track Hub USB bus powered? Will it work with my Digital Audio Workstation (DAW)? What type of audio outputs does the M-track Hub Have? How many USB devices can i connect to the M-track Hub? For an Apple computer running Mac OSX, no drivers are required. On a Windows 7 or newer computer, only one driver installation is necessary, found on the M-Audio Drivers/Updates page. The M-track Hub does not require a power supply to function as an audio output device. The unit will power on and carry audio from your computer via the USB connection. In order to use the USB outputs to connect MIDI devices or data storage, the M-Track Hub must be connected to the DC power adapter (included with purchase). Yes! Virtually any Mac OSX or Windows Digital Audio Workstation (DAW) software capable of using a USB audio interface will work with the M-Track Hub. The rear outputs on the M-Track Hub can accept balanced and unbalanced line connections. The main output is controlled by the large Monitor Level knob. There is also a separately controlled 1/4 inch headphone output connection. Note that only XLR and TRS type connectors carry balanced signals, while TS and RCA type connectors are always unbalanced. How many USB devices can I attach to the M-Track Hub? The M-Track Hub has the ability to power up to three USB devices at one time. Hard drives, MIDI keyboards, drum machines, smart phones and tablets can all be connected and powered through the M-Track Hub as long as the DC power supply is connected.